Before online pokies came and changed the casino industry forever, the only choice punters had was to play on a mechanical pokie machine. We take a look at how the old one-armed-bandits and electronic pokies work and why their online counterparts are just so much more worthwhile when it comes to playing for real money. What is a mechanical poker machine? 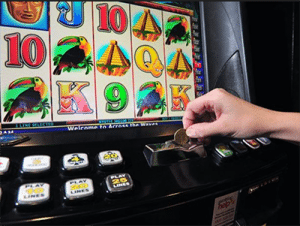 Mechanical poker machines, otherwise known as electronic pokies or slot machines, are the standard pokies you’ll find offered in land based casinos, pubs and clubs around Australia. There’s a long history behind these machines, dating back to the late 1800’s when Charles Fey designed the first ever slot machine in San Francisco, known then as the Liberty Bell. These original mechanical pokies were controlled manually with the use of a lever (hence how the nickname one-armed-bandit came about) which players would pull to spin three reels containing five symbols in the hopes of lining up a winning combination of diamonds, spades, hearts, horseshoes and liberty bells. 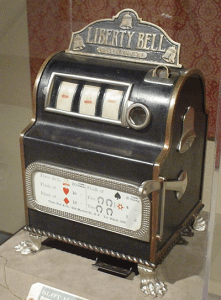 The Liberty Bell machines paved the way for the electronic pokies we know today, with the first electromechanical slot machine, Money Honey, created by Bally Entertainment in 1963. Money Honey was the first machine with the ability to offer a bottomless hopper and automatic payouts that didn’t require the help of an attendant, and the popularity of this game is how the dominant electronic pokies came about. With advances in technology, by the 1970’s mechanical pokie machines were able to offer full colour screens, and by the 90’s pokies were on par with video games in terms of graphics, sounds and usability. Machines are now fully electronic, using computerised RNG (random number generator) technology to place bets and spin the reels with the push of a button. The first mechanical pokie machines were operated by a series of finely tuned gears and levers that required manual handling to power the reels. Today’s modern machines require nothing of the sort and are powered entirely by computer chips and electronics. The modern electronic pokie machines you’ll find in Australian casinos today consist of a series of complex parts. The game itself is powered by a motherboard, just like the inside of a desktop computer or video game console. The motherboard contains the software that controls the game, including RNG and game data like records of the machines previous wins, total game payouts and incoming revenue. The motherboard is housed within the game cabinet, which advertises the game name and is usually brightly coloured and emitting sounds and lighting to grab player’s attention. At the front of the cabinet you’ll find a coin or note slot which is where money is inserted in order to place your bet, along with a coin tray where any winnings are paid out. To select the size of your bet, play the game or collect your money, there’s a series of buttons displayed at the front of the cabinet. The game itself is displayed on a video screen interface, with computerised graphics and animation used to spin the reels. Lining up symbols on pre-determined paylines is how wins are created, while electronic games also offer bonus features like free spins and the option to gamble your winnings. If you think pokie machines have come a long way since the early mechanical days, you’ll be blown away when you see what online pokies have to offer. Online pokies are powered by sophisticated gaming software that’s been developed by some of the world’s best game studios, with computerised technology allowing online games to offer cinematic grade animation and all kinds of unique bonus features. 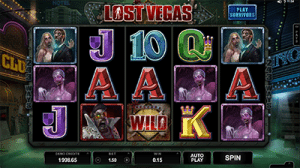 Video slots provide a much more engaging player experience, with a stronger focus on entertainment and storylines. Some game developers have even teamed up with big film and TV networks like Universal Studios to bring your favourite movies to the reels of the pokies. With literally thousands of games available online, you can choose pokies to suit your personal tastes, enjoying the luxury of being picky about themes and features. Online casinos allow you to sample games for free in demo mode, so you can get a feel for a game without first risking any of your own money. Once you’ve found an online casino and game you like, you can make a real money deposit in Australian currency and the casino will reward you with a welcome bonus that typically includes a matched deposit bonus and free spins. Couple that with the comfort and convenience of playing from home and you’ll never bother with an electronic poker machine again. Do old one-armed-bandit pokies still exist? You can still find the old pre-electronic pokie machines around the place, but not for real money play. The old mechanical machines have become collectors items and many people restore these games for sale at auction, online or in antique stores. Mechanical one-armed-bandits are typically used for display purposes only or you might find people using them for entertainment at home, with many dusty old machines lying around in suburban sheds filled with old one and two cent coins. See how far the pokies have come since the early mechanical poker machines by playing online at Raging Bull Casino, our top-rated casino site for players from United States, which has some excellent welcome bonuses available for new players along with hundreds of real money casino games to choose from.